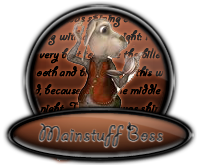 The Mainstuff Bosses are the people who are responsible for making sure the Main Page of Elfpack is maintained a looks nice. They spruce things up, release new polls, write news articles, and watch the various features to ensure they're being updated in a timely sense. They keep a watchful eye on Mainstuff to always know who is doing what to it, and when. If you would like to request something of yours posted on Mainstuff, add your suggestion at MC. 2011-09-11 [HeAVenShallBuRN]: CAn I poke the mainstuff bosses? 2011-09-11 [Stephen]: Unless it's about Main, anyway.